The current risk assessment for mammals is based on external exposure measurements (EFSA, 2009). Exposure to a chemical does not mean, however, that all of the dose will be bioavailable. Bioavailability, i.e., fraction of dose that reaches the systemic circulation or is made available at the site of physiological activity, as well as toxicokinetics (e.g., absorption, elimination) strongly influence the accumulated dose of a toxicant, and it is its internal concentration which makes an effect. 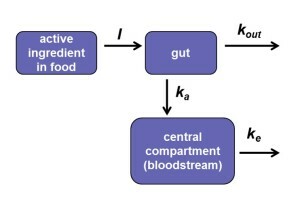 Internal concentration is the net result of absorption, distribution, metabolism and excretion (ADME), and the toxicokinetic (TK) model is a mathematical description of these processes. To understand the relationship between the external and internal concentrations of toxicant better, we need toxicokinetic models that translate an external concentration of a toxicant, which can change in time, to an internal concentration at a target site as a function of time. Such models allow for predictions of concentrations of toxicant in the body for different realistic exposure scenarios and enable interspecies extrapolation, which may reduce the need for animal testing. The main aim of the project was to explore the mechanisms that drive pesticide risk to birds and mammals by developing a toxicokinetic (TK) model that can be used as a refinement option in bird and mammal risk assessment. The model was parameterised and verified for specific compound based on data from metabolism study on rat. We used data for absorption, tissue distribution and excretion from a rat study with 14C-labelled thiamethoxam. The number of compartments (tissues) in the model and the complexity of the processes of absorprtion and elimination were also investigated using these data. Feeding rate scenarios and avoidance of contaminated food were taken into account in the model because they may influence the concentration of chemical in the body and the risk for animals living in natural environments. To identify the main physiological processes and the level of detail with which organisms have to be described in TK model the following questions were considered: (1) Can kinetic processes be described as first order for absorption and elimination of thiamethoxam? (2) How many compartments (tissues or organs) should be included in the model? Is it necessary to represent target organ(s) as separate compartment(s) or is the toxicant concentration in the systemic circulation (blood) sufficient? Because feeding pattern may determine toxicity of chemicals for animals living in natural environment, we also checked (3) how different feeding scenarios influence the internal dose of toxicant in the body? Understanding both physiological and ecological processes contribute to a better understanding of the risk of different patterns of use of pesticides. The values for absorption and elimination rate constants estimated from fitting one-compartment model to the radiolabelled data (compartmental analysis; WinNonlin Version 5.3; Pharsight Corporation, Mountain view, CA, USA) were used to simulate the change of the pesticide body weight-normalized dose in the body with time for different feeding scenarios. For this purpose, the internal tissues of the organism excluding the gastro-intestinal tract (the content of which is not strictly ‘in’ the organism) were treated as a single compartment. Thus the animal ingests food with residues of a toxicant, the toxicant is absorbed from the gastro-intestinal tract into the bloodstream and transported to target organ(s), and then is eliminated from the body. Elimination may occur by several routes including loss in urine and faeces. The rates of change in the doses of thiamethoxam in the gut and bloodstream were described mathematically as the difference between compartment rates of uptake and loss. Exchange rates between compartments represent physical transfers of a substance, as biotransformation of thiamethoxam to metabolites was not taken into account in the model. No distinction was made between the rate of the loss of pesticide from the gastrointestinal tract and its appearance in the systemic circulation; what is lost from the gastrointestinal tract all appears in the systemic circulation each time unit (Figure 1). Figure 1. Body burden model illustration. where ΔC indicates change in the body weight-normalized dose of pesticide in given time interval, here one minute; subscripts gut and int denote gut and internal (bloodstream), respectively; I indicates ingestion rate (i.e., the rate of toxicant transfer from exposure dose to the gut, mg a.i. kg-1 bw min-1); F represents bioavailability, here F=1; ka represents the rate of toxicant absorption from the gut into the system (min-1), and ke – the rate of toxicant elimination from the system (min-1). (4) LD50 dose eaten with constant ingestion rate of 13 mg a.i. kg-1 bw min-1 within 2 hours in total but with 4-hour break after the first hour of feeding. All simulations were run with worst-case combination of values for ka and ke rate constants. The maximum internal concentrations (max Cint) were used as a metric for comparison between different exposure scenarios. According to our expectations, the highest max Cint were reached when the LD50 was given as a bolus dose (1193 mg kg-1 bw). In the two feeding scenarios with continuous feeding, maximum doses of thiamethoxam in the body were: 1102 and 939 mg kg-1 bw, for scenario 2 and 3, respectively. 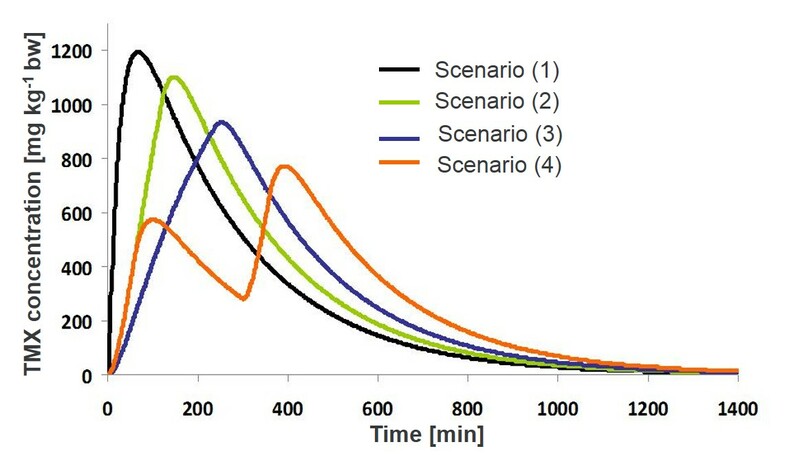 The lowest max Cint was obtained in the scenario when LD50 was eaten in two one-hour feeding bouts separated by a four-hour non-feeding break (777 mg kg-1 bw) (Figure 2). Under field conditions, animals are not likely to eat all their dietary requirements in one bite (i.e. as a bolus dose) but rather via ingestion with a slower feeding rate over much longer periods. Because we showed that higher maximum internal concentrations were reached when LD50 dose was given as an oral gavage bolus (standard dosage in LD50 test on mammals, e.g. OECD 2001), it can be expected that the use of gavage dosing results in high systemic levels that induce more adverse effects than if an equivalent dose is given via the diet at slower feeding rates. Here, we propose the use of maximum internal dose (max Cint) to estimate risk, as for compounds that are excreted rapidly (such as thiamethoxam) acute effects are usually associated with peaks. However, for other modes of action, the cumulative exposure (AUC) may be a more valid endpoint for comparison between different exposure scenarios. Toxicokinetics is only the first part of risk estimation, as toxicodynamics also affects risk. Recovery is not necessarily immediate; effects can be additive over time at a constant internal dose and might not disappear once the toxicant leaves the system. Therefore, the body burden model should be interpreted with care for different pesticides especially with very different physico-chemical properties in relation to what is known about a toxicant’s mode of action in the species of interest. The present work focuses on integration of ADME study in higher-tier risk assessment, thus extending the use of existing data, and provides a framework for simple toxicokinetics modelling without complex details of the physiological mechanisms, yet it captures the dynamics of the internal doses of thiamethoxam. Using the simple model we showed that different feeding patterns may influence internal dose of thiamethoxam. However, before using simple models for other chemicals it is important to understand what data are needed to check the assumptions and the advantages and limitations of such approach, as well as where and how it should be adapted or extended. Some animals have developed mechanisms that enable them to avoid contaminated food. Although it is hard to determine precise mechanisms for any given pesticide, avoidance is commonly seen in dietary studies and has the potential to reduce exposure, and hence risk, in the field as it prevents body burdens from reaching harmful thresholds. We used data from avoidance experiments on rat to identify the possible mechanism of avoidance to could implement avoidance into TK model. Clear evidence of avoidance in terms of eaten dose was found, but it was not stable over time. Because no evidence for fixed internal threshold was found, the mechanism of avoidance is not fully understood yet (Slides 1 pdf). Deterministic approaches have been illustrated above, but an probabilistic approach was also explored: the simulations of real-world scenarios, i.e., involving various elements of uncertainty were run using Crystal Ball software which permits Monte Carlo analysis. The results were presented during SETAC North America conference (Poster 2 pdf). Also, the work on the implementation of TK processes into IBM model was done as a result of cooperation with project Mammals-1. See the article ‘Incorporating toxicokinetics to individual-based model for a more realistic pesticide exposure estimate: a case study on the wood mouse’ in the special issue of Ecological Modelling. The project was based in Syngenta under supervision of Pernille Thorbek and associated partners were CRD and Bayer. The co-supervisor of the project was Prof Richard Sibly from Reading University. Such cooperation with both companies and academia was a great opportunity to develop a model which follows general standards for regulators and provide additional input in pesticide risk assessment as well as is interesting from the scientific point of views. The results of direct collaboration within work package 3 (Vertebrate) were published in Ecological Modelling. Bednarska A.J., Edwards P., Sibly R., Thorbek P. 2013. A toxicokinetics model for thiamethoxam in rats: implications for higher-tier risk assessment. Ecotoxicology 22:548-557. Bednarska A.J., Jevtić D.M., Laskowski R. 2013. More ecological ERA: incorporating natural environmental factors and animal behavior. Integrated Environmental Assessment and Management 9(3): e39-e46. Liu C., Bednarska A.J, Sibly R.M., Murfitt R., Edwards P., Thorbek P. 2013. Incorporating toxicokinetics into an individual-based model for more realistic pesticide exposure estimates: a case study on the wood mouse. Ecological Modelling (accepted).